Seeking to allay anxious reporters, Donald Trump's transition team said Thursday that his administration will have a traditional press pool. 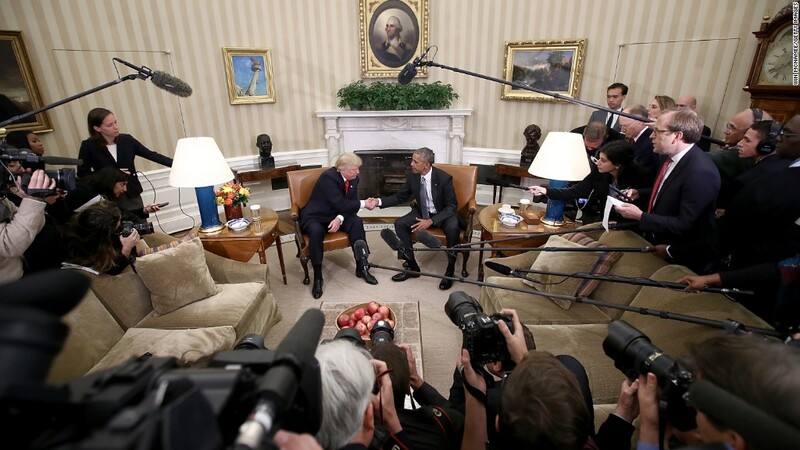 The promise came after Trump's team failed to follow traditional press protocols and left behind a media pool assigned to cover the president-elect when he flew to Washington to meet with President Obama. "We fully expect to operate a traditional pool and look forward to implementing our plans in the near future," Hope Hicks, a spokesperson for the president-elect, said in a statement. "We appreciate your patience as we navigate the transition process." But political reporters, already fearful of Trump's treatment of the press after his fierce anti-media rhetoric during the campaign, grew increasingly worried on Thursday after Trump's team left the press pool behind. Related: Obamacare under President Trump: What happens next? "The White House Correspondents' Association is deeply concerned by President-elect Donald Trump's decision to reject the practice of traveling with a 'protective pool' of reporters for his first visit to Washington since the election," Jeff Mason, the president of the White House Correspondents' Association, told CNNMoney. "This is unlike how things have worked for previous presidents-elect, and is not at all how the Obama White House handles press access," said Edward-Isaac Dovere, the Politico reporter who handled the pool report for Thursday's visit. "They informed us last night that they would not provide flight access from New York to D.C. They did not respond at all this morning to questions about access, having referred it all to the White House and White House Correspondents' Association," he said. The press was given access by the White House to a pool spray with the president and the president-elect. "The president-elect transition pool functioned today without any involvement from the president-elect or transition, but with the engagement of the WHCA and the White House," Dovere said. Even with Hicks' pledge to keep a press pool, the Washington press corps and journalists generally remain concerned about press access in a Trump administration. "In addition to breaking with decades of historical precedent and First Amendment principles, this decision could leave Americans blind about his whereabouts and well-being in the event of a national crisis," Mason said. "A pool of reporters is in place and ready to cover President-elect Trump," he continued. "The WHCA urges President-elect Trump to allow it to do its job, including being present for motorcade movements, meetings, and other interactions. Not allowing a pool of journalists to travel with and cover the next president of the United States is unacceptable." During the presidential campaign, Trump blocked the media from travel with him, blacklisted certain journalists and outlets for critical coverage, and repeatedly attacked the media for being "dishonest" and untrustworthy. "The WHCA has had trouble getting responses from the Trump campaign for weeks," Dovere said. "Whatever their reasoning is, what happened today puts the transition in line with the campaign's treatment of the press."